This year has seen the arrival of a number of “cloud” mining services - companies that will sell you mining contracts and pay you out with the proceeds. Generally this means you’re renting mining hardware directly, and you get paid out with whatever that hardware produces. Genesis Mining is a bit different, in that you don’t rent the hardware directly. Instead, you get a contract for a set amount of hashing power, which you can target against various alt-coins like DarkCoin, LiteCoin, etc. At the end of the day, Genesis Mining converts your mining efforts back into Bitcoins and pays out into your own wallet. 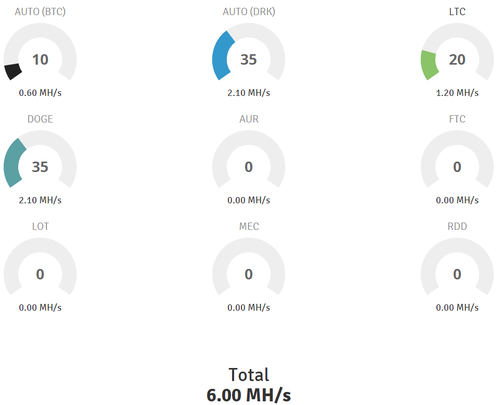 The site has a nice dashboard that lets you allocate your hashing power to one or more alt-coins, or just set it to auto and they’ll calculate the most profitable coin to mine for you. I signed up a bit over a month ago, and purchased a total of 6 MH/s, for 1.52954788 BTC, or about $940 USD at the time. 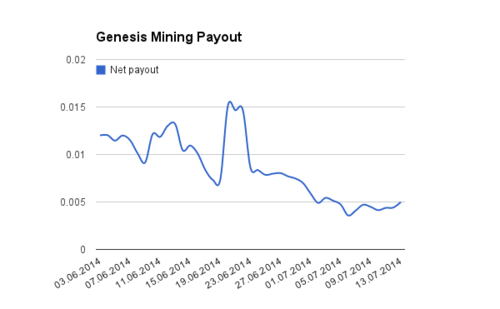 I’ve left the mining set to “auto”, so Genesis Mining can figure out which coin is the most profitable. While I’ve made back 0.351144 (23% of my initial investment) in a bit over a month, you can see that payouts are definitely trending down. I’m happy with the payouts so far, but I would like to know, on a daily basis, just what my MH/s are being used to mine. I’ll update again in the future to show how it’s going. Hopefully, I’ll at least break even by the 6 month-mark. Claim free satoshis at Moon Bitcoin. 290 satoshi every 50 mins.